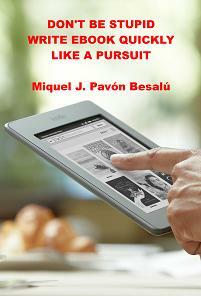 Subtitle: Don't be stupid write ebook quickly like a pursuit. Author: Miquel J. Pavón Besalú. Abstract: It is a brief summary and guidance that explains everything you need to do to anyone who wants to successfully start writing ebooks. He makes a comparison between the traditional book and the digital book highlighting the advantages and disadvantages. It explains steps that must be taken in order to self-publish on the net any text. Just giving some basic guidelines for a successful self-promotion. Finally it provides the best solution to sell many ebooks.